At long last, I’ve finished cleaning, commenting, and packaging up code for binary pursuit spike sorting, introduced in our 2013 paper in PLoS ONE. You can download the Matlab code here (or on github), and there’s a simple test script to illustrate how to use it on a simulated dataset. The method relies on a generative model (of the raw electrode data) that explicitly accounts for the superposition of spike waveforms. This allows it to detect synchronous and overlapping spikes in multi-electrode recordings, which clustering-based methods (by design) fail to do. If you’d like to know more (but don’t feel like reading the paper), I wrote a blog post describing the basic intuition (and the cross-correlation artifacts that inspired us to develop it in the first place) back when the paper came out (link). 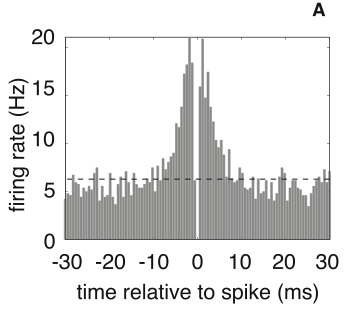 I’m proud to announce the publication of our “zombie” spike sorting paper (Pillow, Shlens, Chichilnisky & Simoncelli 2013), which addresses the problem of detecting overlapped spikes in multi-electrode recordings.